The first casting from a new mold is where you make the big mistakes. I knew that was particularly likely with Oliver because of the placement of his feet. Legs often get shifted during the demolding process. 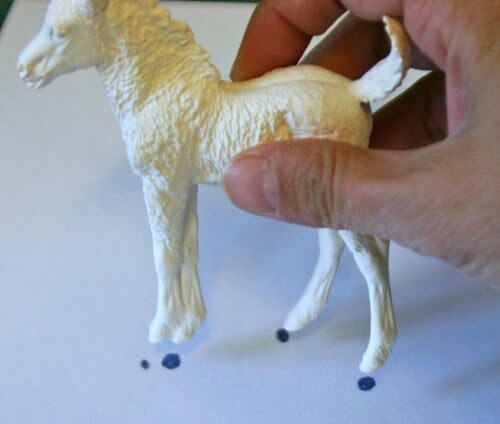 There is also the problem of how drying clay can effect the balance of the horse. Because this is particularly a problem with standing horses, and because Oliver is “tripoded” (that is, he balances on three points), I expected the first casting to be a little off. As the picture above shows, he was more than a little off! He is listing to starboard in a pretty obvious way. 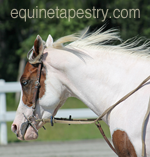 We usually adjust for a weight-bearing leg “pulling up” by shifting it ever so slightly in the opposite direction. The idea is that as it dries, it will pull into the proper place. But to know what constitutes a small shift, I need to have the legs lined up properly. Since the change is usually too subtle to see even when placing the original next to the casting, I needed another way to check. Here I’ve painted the hoof bottoms of the resin Oliver with underglaze. I could have used any paint, but the underglaze was handy and it washes off the resin easily. While the feet were still wet, I set him down on a sheet of white cardstock. Now I have a guide for proper foot placement. It is not, however, the right size. My final clay shrinkage is around 6%, with most of that happening during the drying process. 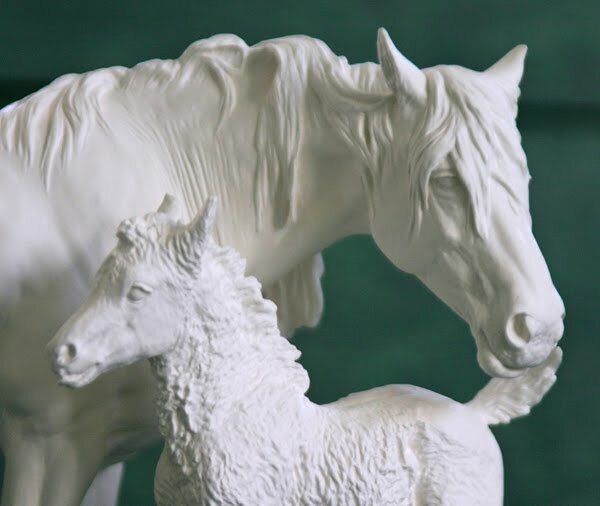 Usually there is a tiny amount of shrinkage while the horse is still in the mold; that’s what enables us to wiggle the casting free of the plaster. That is the point at which I’m usually adjusting the legs. So I needed my placement guide to be just a hair smaller. To do that, I scanned the card stock with the footprints and then printed it out at a 1% reduction. I printed a second page out at a 6% reduction so that I could check it again once the piece was dry. I can’t change the legs after that point, but at least it gives me a chance to check that casting isn’t hopeless before I invest the time in cleaning the greenware. So far this has worked and all the subsequent Olivers have stood level. 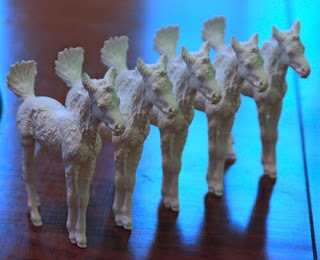 I also have Elsie’s pattern ready for when her molds are working, just in case! You might wonder, looking at the tilting Oliver, why I bothered to clean and fire him. I’ve found out the hard way that no matter what goes wrong with the first casting early, it is best to keep working because there are sometimes more discoveries. It is better to find them on a casting that is already a loss than to lose one casting for each lesson. In the case of Oliver, I also found that I needed to cast him thicker than usual so I could clean out the clay from the gap between his front legs. Otherwise he ends up with an oddly placed post hole between his front legs. We are used to seeing a belly hole where the horse is posted in the kiln, but a hole in the chest area looked a bit disturbing.